We have reached a new milestone in the teaching of Punjabi in Australia. Gurmeet Kaur, entrepreneurial Assistant Secretary National Sikh Council of Australia, has been actively involved in the teaching of Punjabi in New South Wales Australia (NSW) for the past 18 years. She was instrumentally involved in the development of the first Kindergarten to Year 10 Punjabi Syllabus in NSW, in the teaching of the language in community based schools and finally in the development of the language and teaching materials for Years 7 to 10. She has now set a new record by starting the very first Punjabi class in a NSW secondary school achieving this through ongoing consultation with her school Principal over the past few years. This is the first class of its kind in Australia – teaching the Punjabi language as a mainstream subject to multicultural Australian students. She teaches Punjabi to 21 students at Sir Joseph Banks High School Revesby where she has been a Mathematics teacher for the past 16 years. 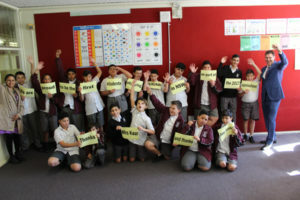 The students in her class are from varying cultural backgrounds; Fijian, Vietnamese, Chinese, Japanese, Arabic, Samoan, Anglo Saxon, Italian and Tongan but none from a Punjabi background. Punjabi is taught as part of the school curriculum. Students are taught 5 hours per fortnight. They learn not only the language but also culture, history, beliefs and foods for a whole year through activities such as cooking and excursions to Gurudwaras and restaurants. The students are really enjoying the learning experiences which include alphabets, muharnees, counting, culture, traditions, religious beliefs and Punjab – the land of five rivers. As part of their assessment they have to design and publish a travel brochure to promote Punjab in Australia and plan a menu for their Punjabi Restaurant – The Dhaba. Gurmeet has successfully incorporated the really vital aspects of Punjabi into the NSW syllabus for 2017. This syllabus emphasizes moving between cultures and creating awareness of cultural diversity. She helps students identify cultural practices in neighbouring Punjabi-speaking communities thereby enhancing their learning experiences. The making of linguistic connections also helps students recognise the diversity of language systems and helps them to explore the different ways in which meaning is conveyed in Punjabi. We are all proud of her and the community is full of praise for her efforts. Well done Gurmeet Kaur.